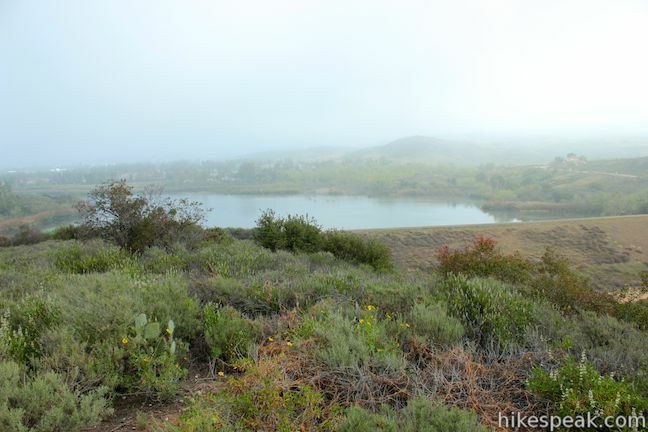 Peters Canyon Regional Park is an Orange County Park preserving 354 acres of open space including the 55-acre Peters Canyon Reservoir. 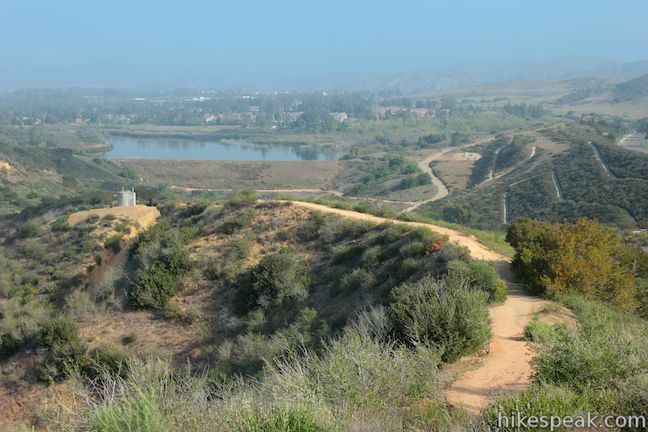 A gradual 2.7-mile loop around the reservoir is popular trail with joggers and dog walkers. 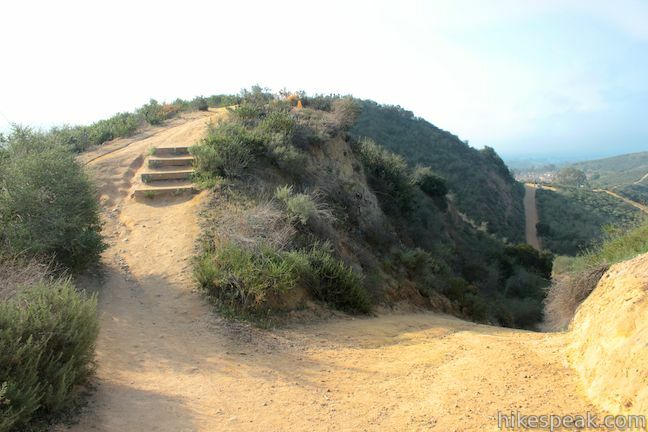 Other trails in the park allow visitors to hike even farther. 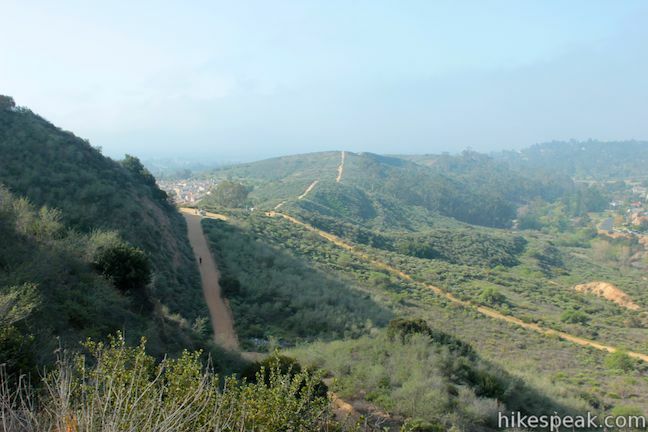 The 5.7-mile East Ridge Loop is an expansion of the Lake View Loop that delivers a grand tour of the park. 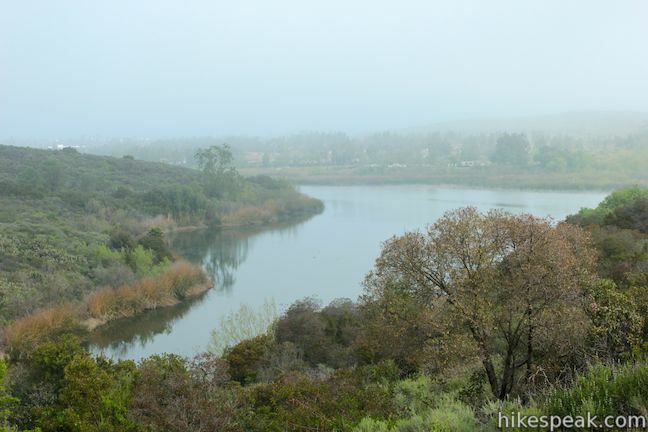 For something in the middle, you can follow the 3.65-mile figure eight-shaped hike described here, which spices up the Lake View Loop with the addition of a short loop to a scenic overlook at the high point of the park above East Ridge View Trail. 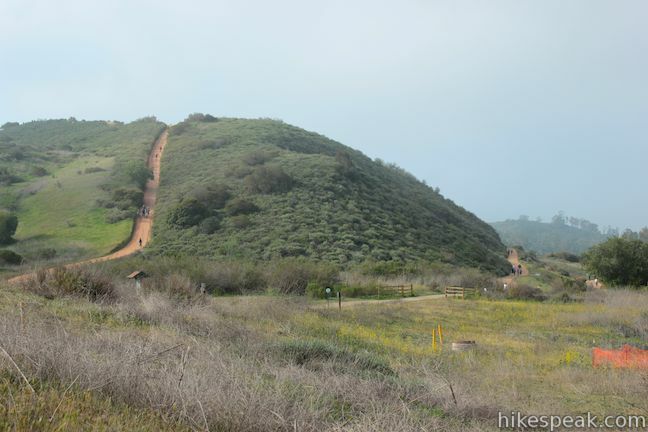 There is 100 feet of elevation change along Lake View Loop, plus a 175-foot climb to the top of the ridge where you will get a panoramic overview of Peters Canyon Regional Park. 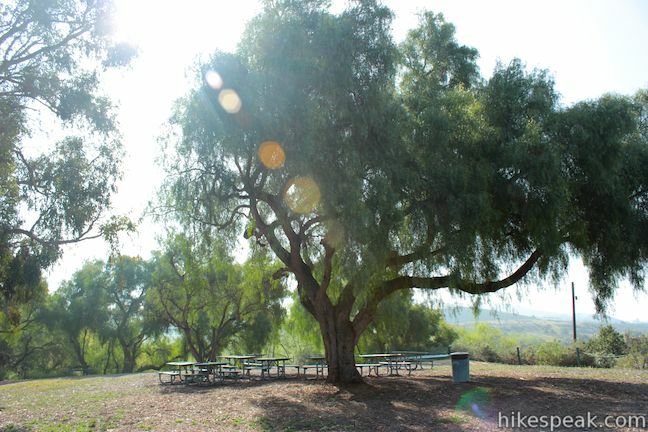 Begin exploring Peters Canyon Regional Park from a trailhead parking area at the main entrance at the north end of the park. 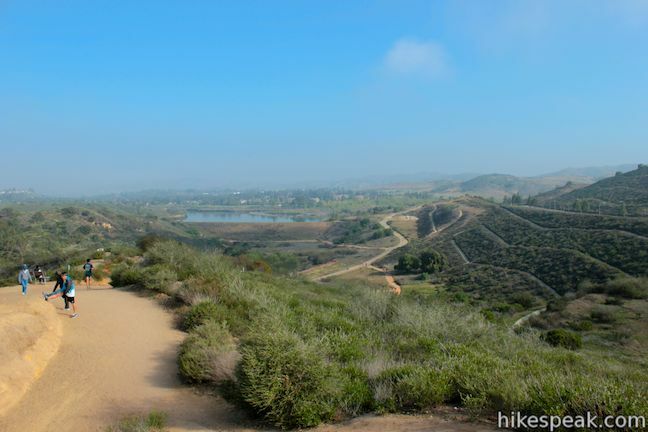 The loop begins next to Peters Canyon Reservoir on either side of the Peters Canyon Ranger Station. 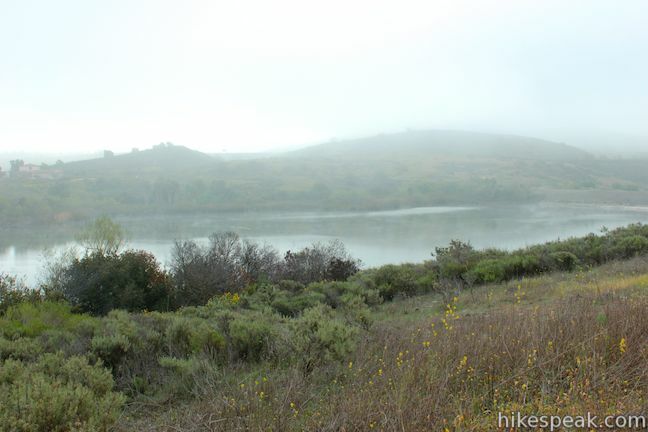 To hike Lake View Loop in a counter-clockwise direction, set out east on Lake View Trail, a wide dirt road making its way across the north end of the reservoir. 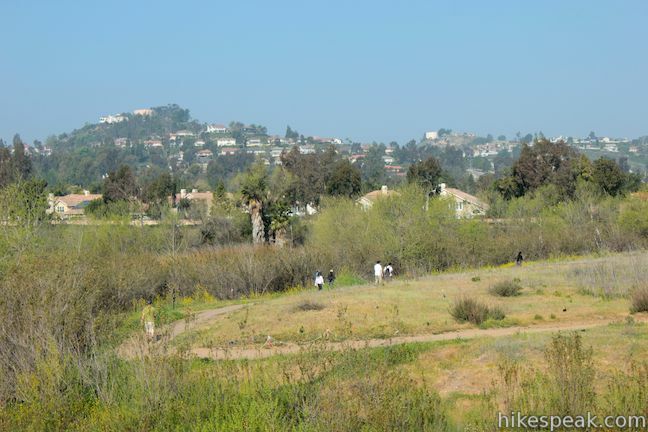 The trail explores a brush-covered area along the lake and comes parallel with Skylark Drive. 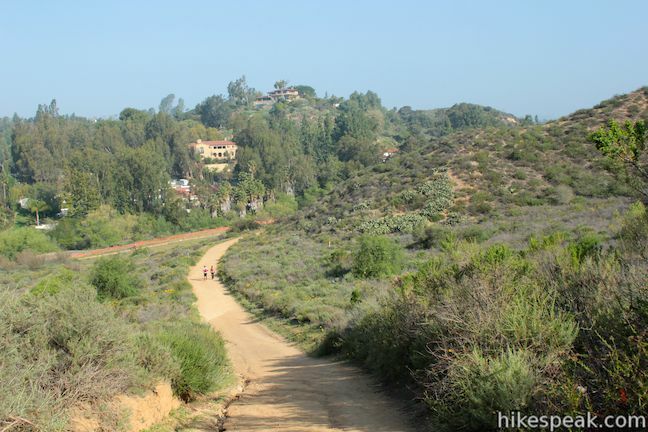 At just under half a mile from the start you will reach the hike’s first well-marked junction. 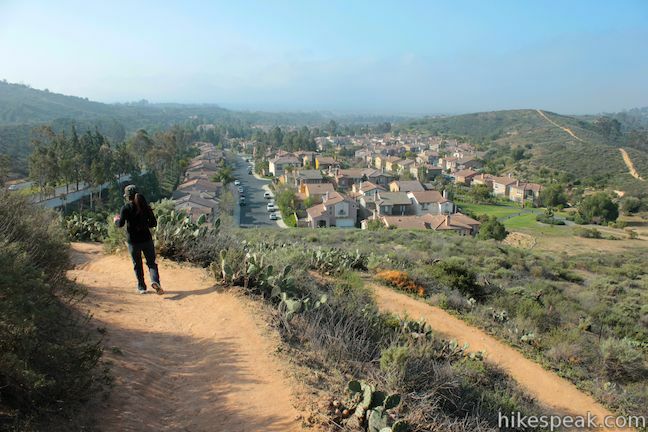 Skylark Trail breaks off to the right, crossing a hill and eventually rejoining Lake View Trail. 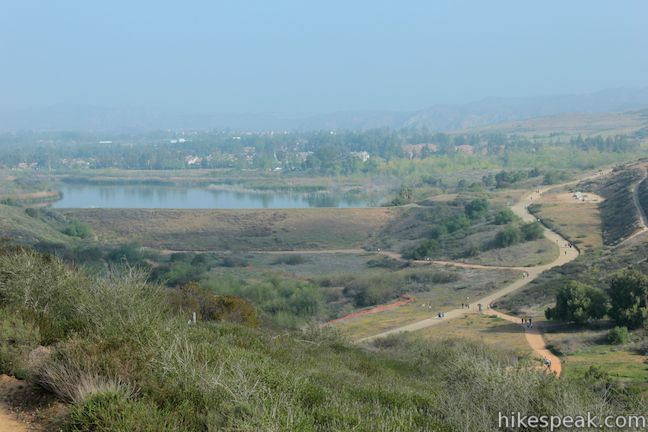 To continue Lake View Loop, stay to the left and hike 0.2 miles to the other end of Skylark Trail. 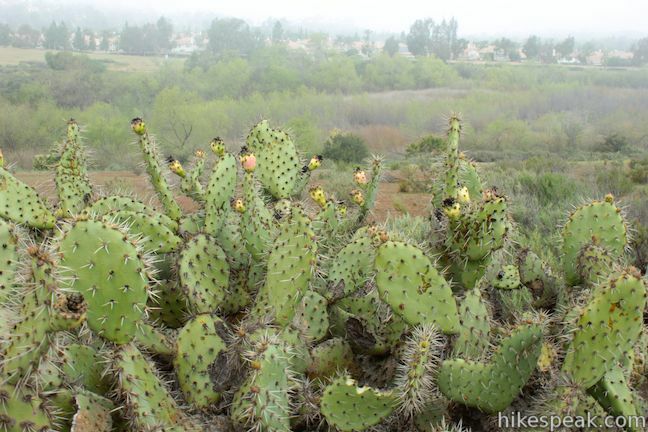 Straight ahead, and just over 3/4 of a mile from the start, you will come to a junction with Cactus Point Trail. 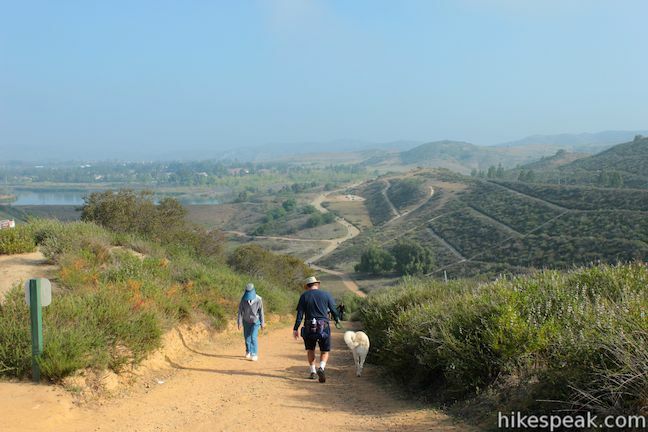 Straight ahead, Lake View Trail makes a direct ascent up one of the park’s short but steep rolling hills. 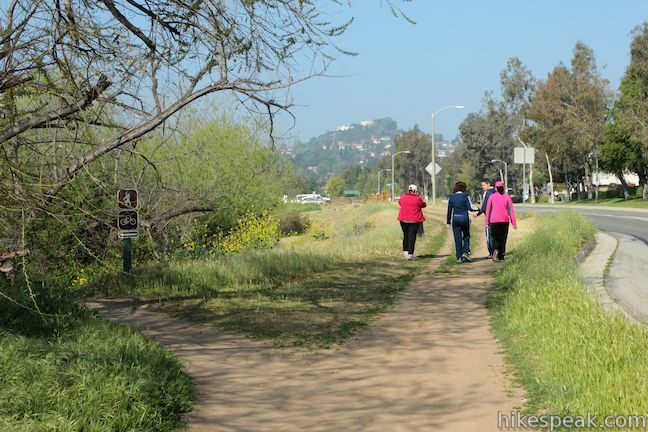 While it sounds a bit confusing, Lake View Loop actually parts with Lake View Trail here. 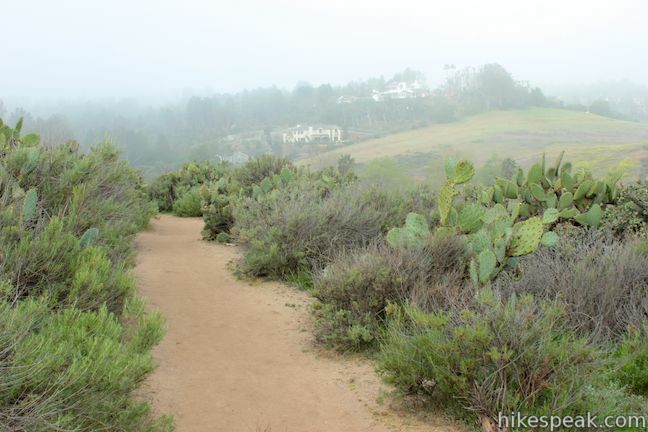 Avoid the steep climb and turn left on Cactus Point Trail, hiking out to a landing overlooking the lake. 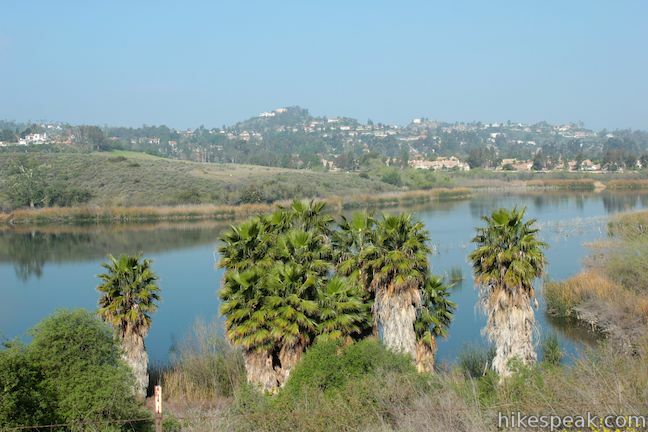 This 55-acre reservoir was man-made by the Irvine Company in 1931. 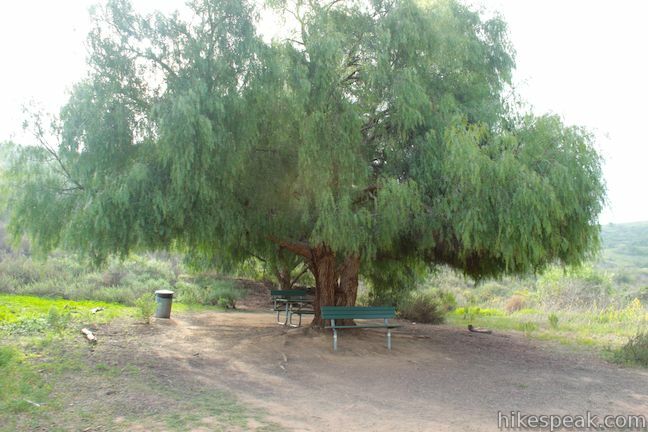 It averages 14-feet deep and is fed by Handy Creek, which enters the park at the corner of Jamboree and Canyon View Avenue. The eastern dam is approximately 50 feet tall. 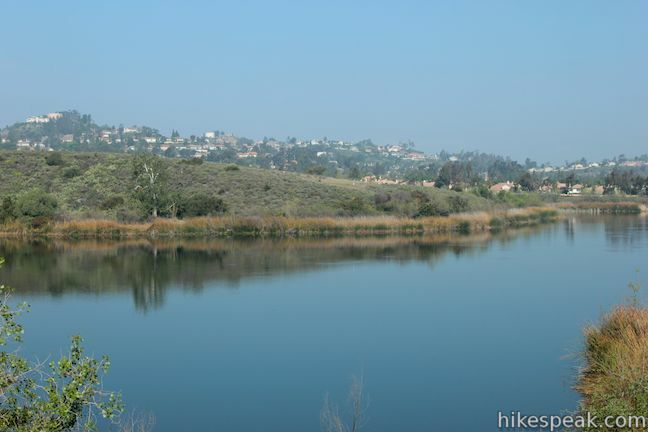 The reservoir was built to regulate the flow of water taken from Irvine Lake to irrigate the Irvine Company’s crops to the south of the park. It also served to conserve precious rainwater runoff. 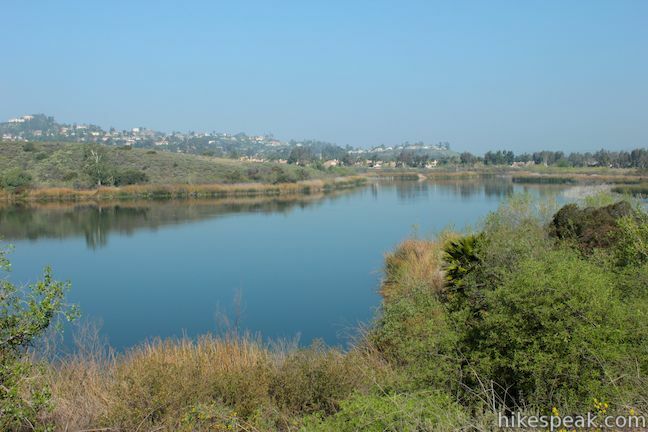 Today the reservoir still protects and controls this area’s watershed and provides an important habitat for fish, waterfowl, insects, and plant life. The dam, towers, and water are closed to the public. Fishing is not allowed. 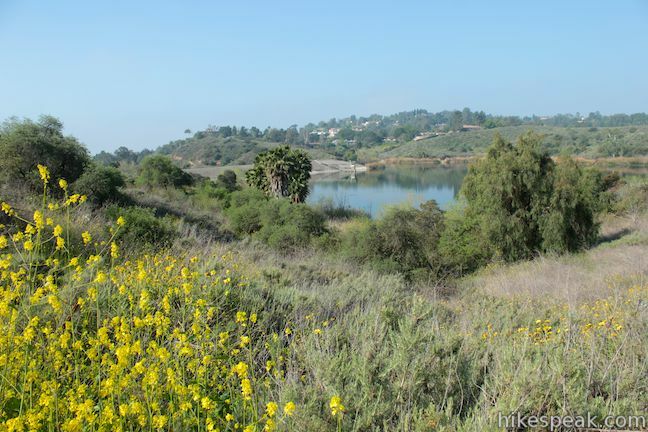 Please help us preserve this important wildlife habitat by respecting all closed areas. 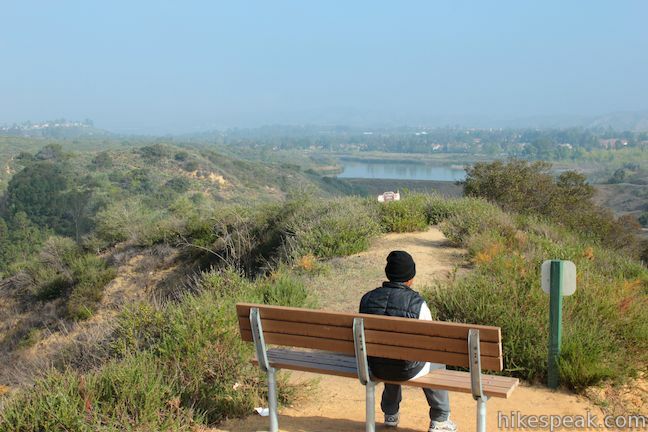 Beyond the bench are more views over Peters Canyon Reservoir, including a perspective of the dam to the southeast. Cactus Point Trail makes a U-turn and heads back to Lake View Trail at a junction near the top of that slope that loomed above the initial junction with Cactus Point Trail. Turn left on Lake View Trail to continue the loop. 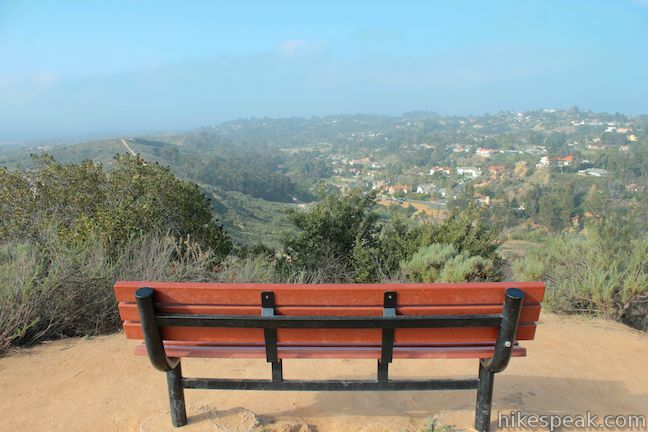 At the top of the crest, 1.3 miles from the start, you will find another bench where you can pause to enjoy the views. 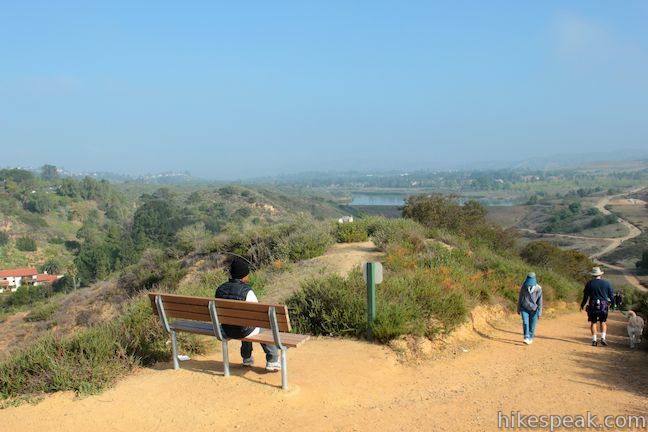 Running along the park boundary, Lake View Trail drops like a rollercoaster into a dip and climbs a second crest (where there is another bench). Angling to the left, the trail then comes to a split. 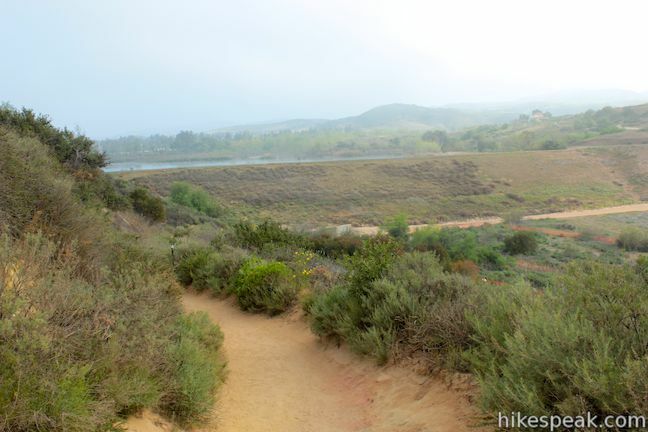 Before you continue down Lake View Trail to the right, turn left on a short spur to a scenic overlook. 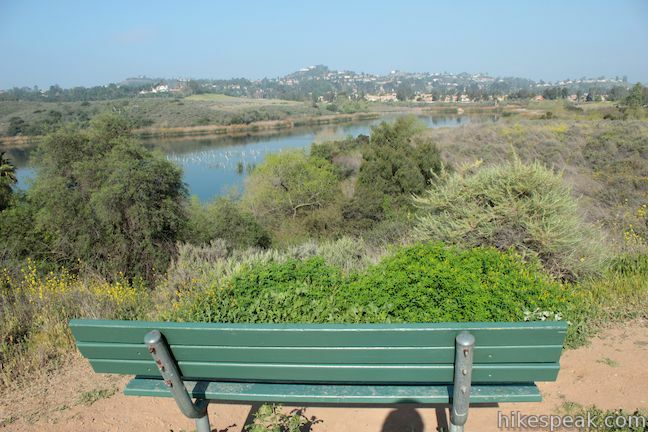 This perch has its own bench and an enticing view over Peters Canyon Reservoir from a landing above the dam. 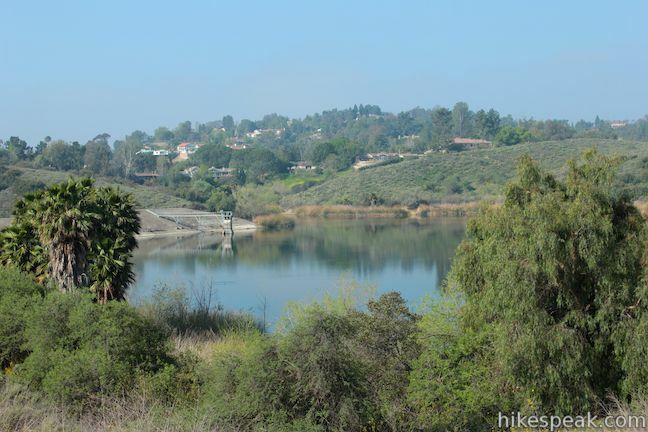 Continue down Lake View Trail, which passes below the dam to a T-junction with Peters Canyon Trail, 1.88 miles from the start. 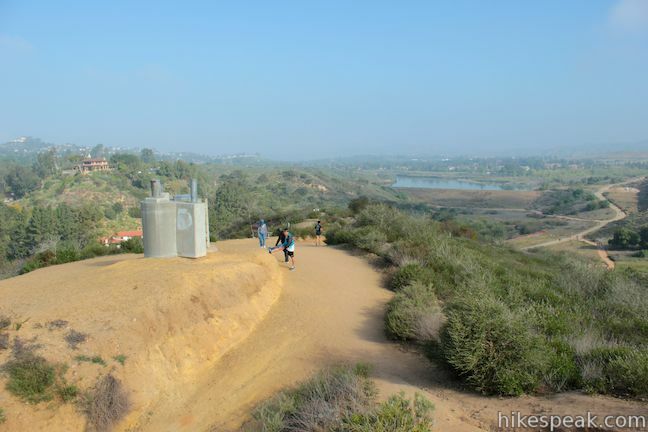 This is the end of Lake View Trail. 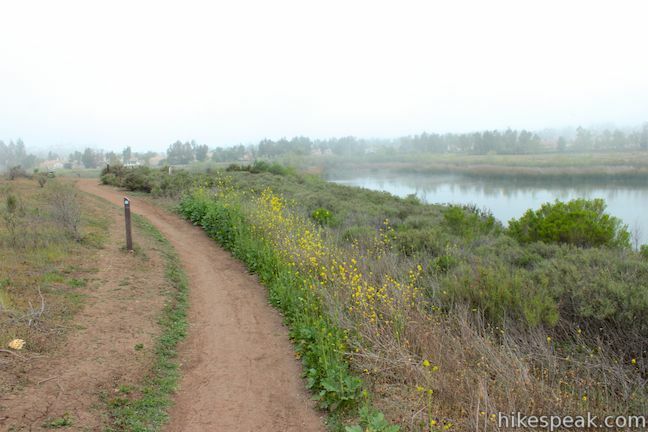 To continue with Lake View Loop, you should turn left to head back to the trailhead. 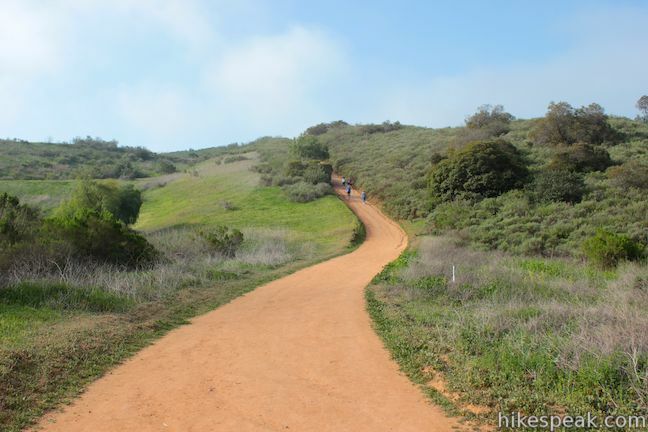 To make the 0.95-mile extension that loops to the top of the ridge (or to hike the larger East Ridge Loop), turn right onto Peters Canyon Trail. 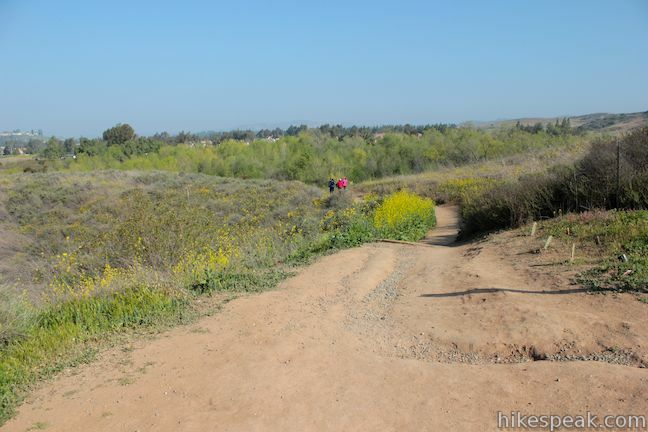 Peters Canyon Trail is part of the Mountains to Sea Trail (or Sea to Mountains Trail), a 22-mile long bike route between Irvine Regional Park and Newport Bay that rightfully receives a good deal of foot and tire traffic. 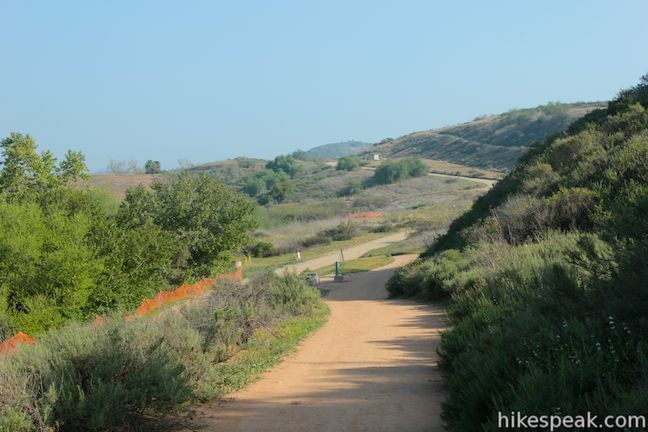 A short distance down Peters Canyon Trail, you will arrive at a junction with East Ridge View Trail, a wide dirt road that takes an undulating route south parallel to Peters Canyon Trail. Turn left here and begin a rapid ascent to the top of the ridge. 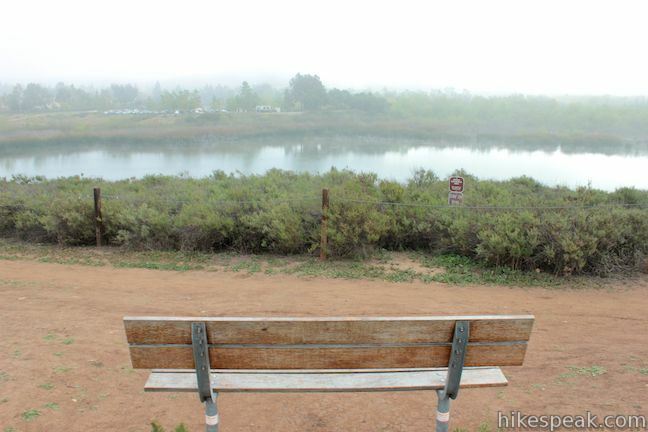 At the top of a 125-foot 0.2-mile climb you will reach a bench with views north over Peters Canyon Reservoir. There is also a small metal structure on this nub on the ridge. 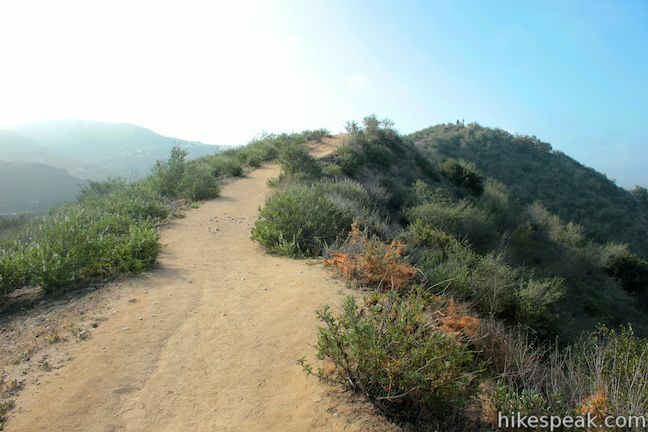 While East Ridge View Trail drops off the other side of the ridge and continues south, you should turn left to reach the top of the ridge. 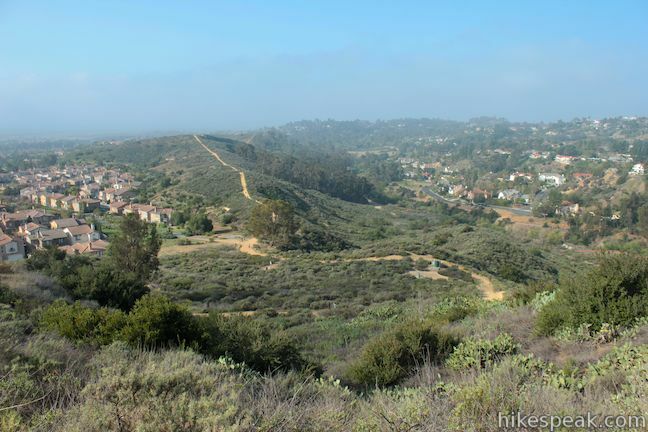 Hike up a wide dirt path along the spine of the ridge for another tenth of a mile, where, 2.25 miles from the start, you will reach a south-facing bench at the summit of the ridge. 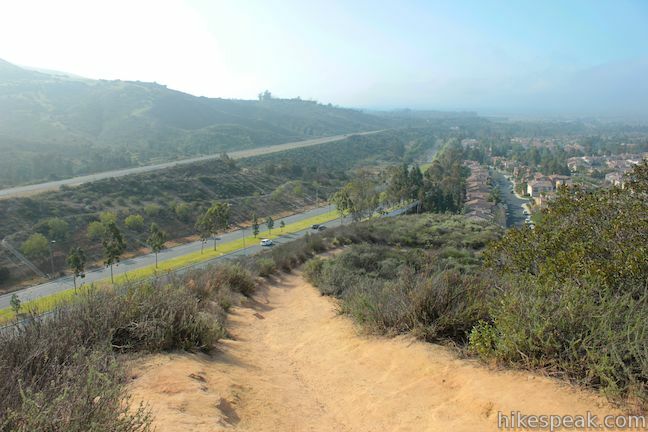 This scenic overlook presents a panoramic top-down view over Peters Canyon Park. 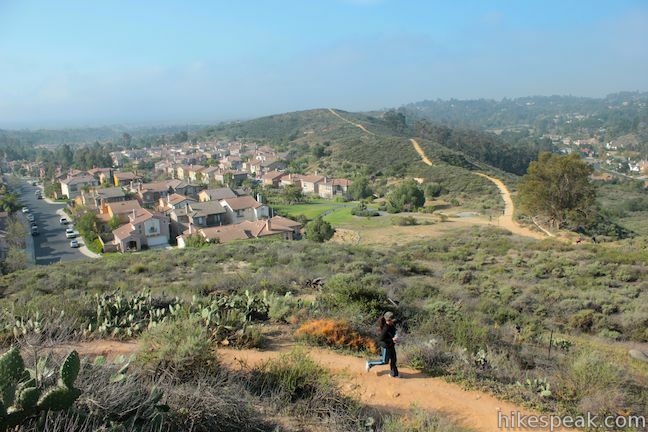 Jamboree Road runs parallel to the ridge to the west, Peters Canyon Reservoir glistens to the north, and in the opposite direction, the south end of the park shows off a green ridge splitting residential neighborhoods in the Tustin – Irvine area. 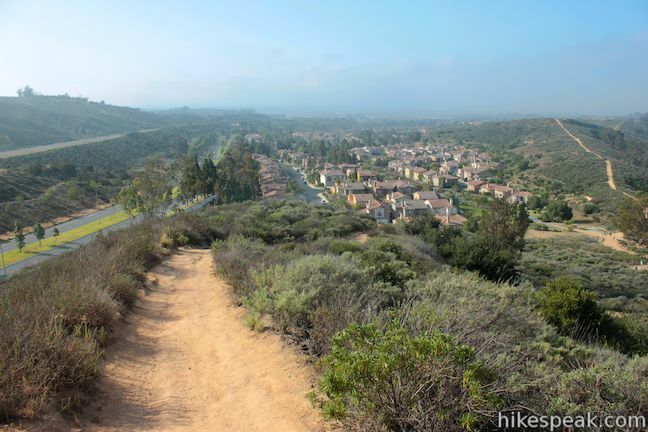 From the scenic overlook, the trail drops down the south side of the ridge and rejoins East Ridge View Trail after another eighth of a mile. 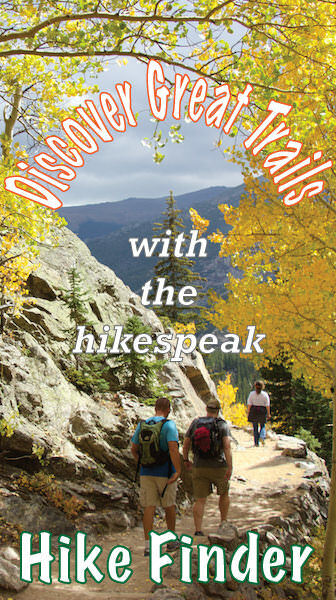 Turn left and hike a few paces to a junction with Gnatcatcher Trail. 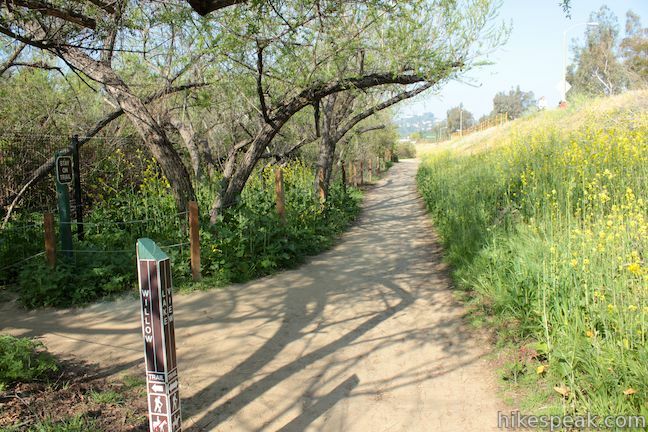 Turn right on this connector, which cuts across the park to Peters Canyon Trail. Gnatcatcer Trail ends after a third of a mile. 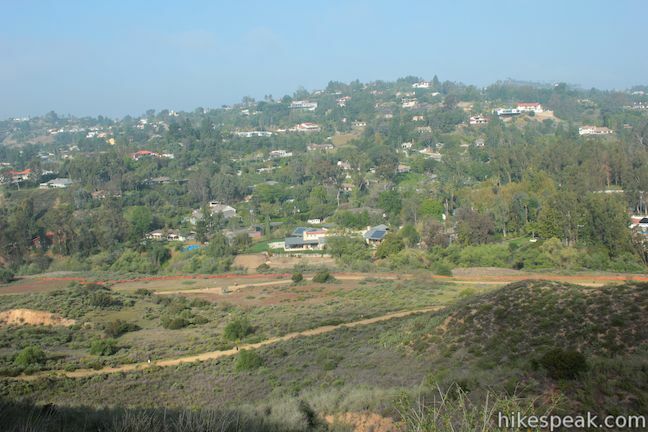 Turn right on Peters Canyon Road, hiking a tenth of a mile back to Lake View Trail (where you strayed from Lake View Loop) passing East View Ridge Trail on the right along the way. 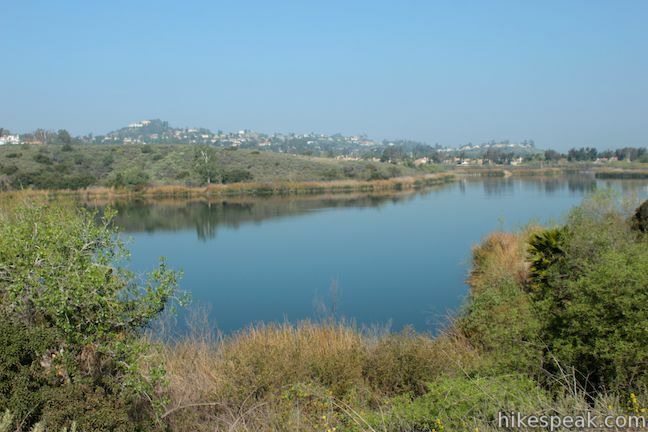 Continue north up Peters Canyon Trail for just over a quarter mile, enjoying lake views until you reach a chain-link gate blocking the road. Angle left onto a dirt trail rounding the lake back to the trailhead. 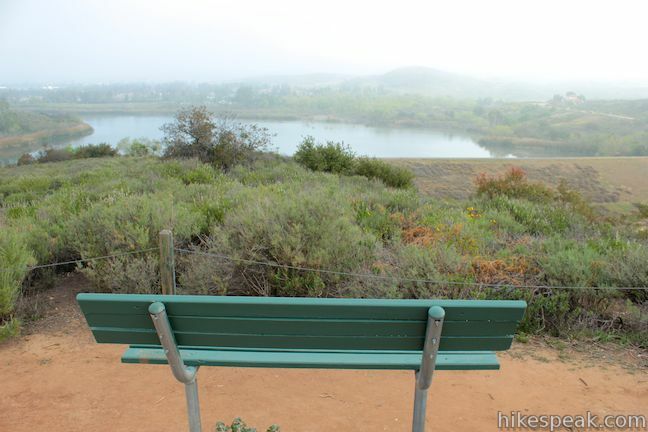 Yet another bench is positioned at this junction (there are a lot in Peters Canyon Regional Park) with nice views of Peters Canyon Reservoir. 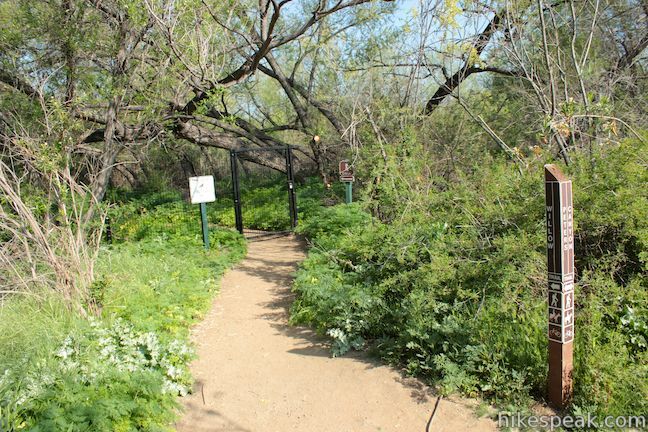 The Willow Trail is closed to all public use during the riparian bird breeding season. 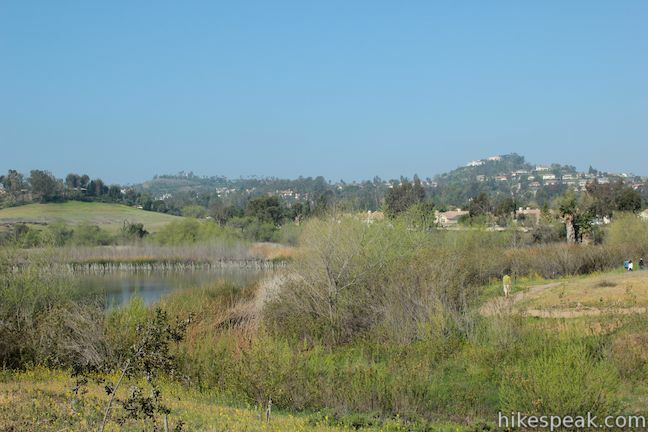 Protecting the birds and other wildlife of the riparian woodlands during this critical time of year insures that future generations will continue to thrive in the park. 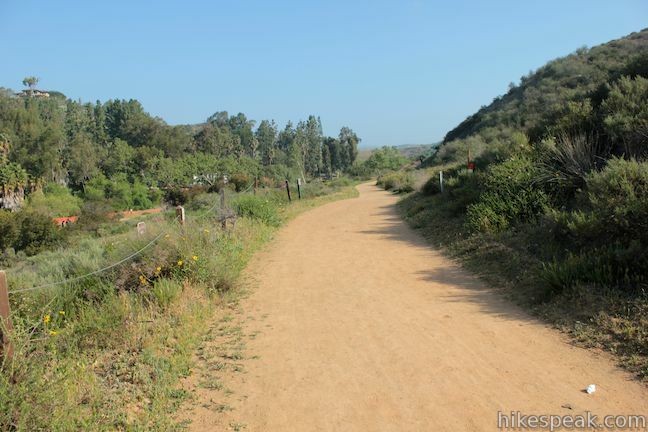 If Willow Trail is closed, continue up Peters Canyon Trail, which turns left and runs north along Jamboree Road. 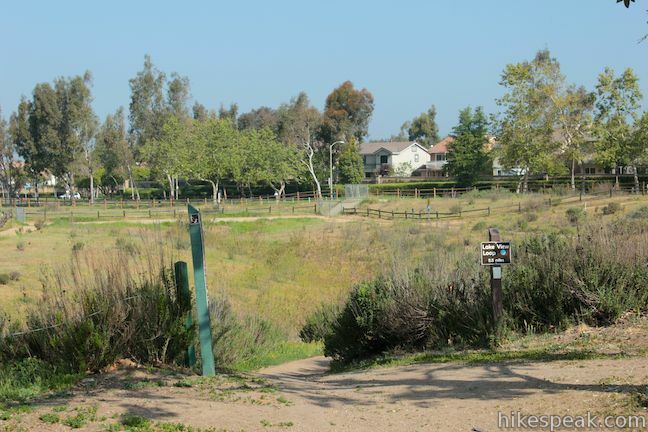 As you approach the intersection with Canyon View Avenue, the trail bends to the left. Border the avenue for a short distance and turn left at a junction with Lake View Trail, which drops down below the roadway and meets the other end of Willow Trail. 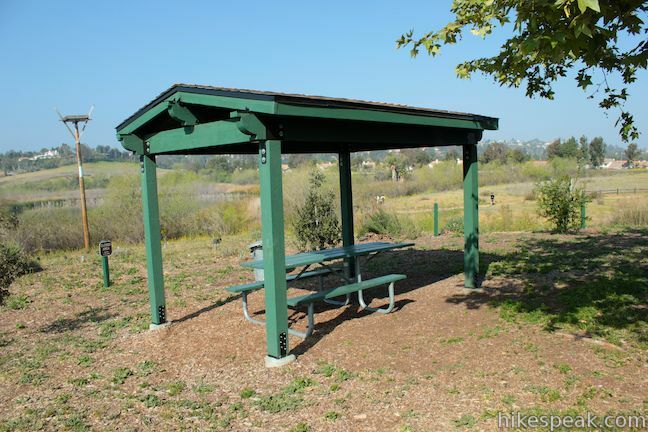 Continue up Lake View Trail, which passes the parking area and comes to an end alongside the Peters Ranch Ranger Station and several picnic tables near Peters Canyon Reservoir. 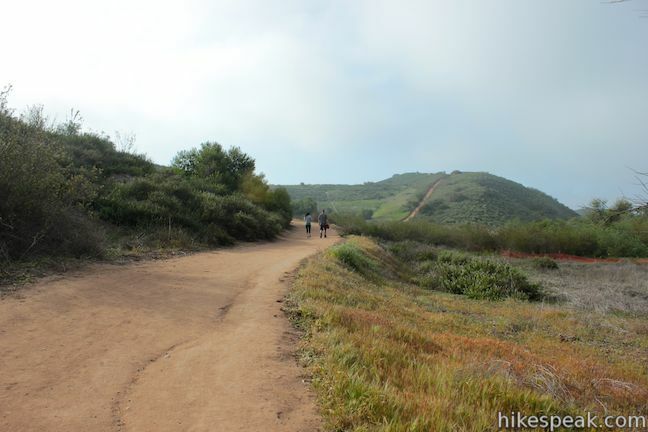 This loop in Peters Canyon Regional Park (Lake View Loop and the short loop to the top of East Ridge) is 3.65 miles long with 200 feet of total elevation between the high and low points of the hike. 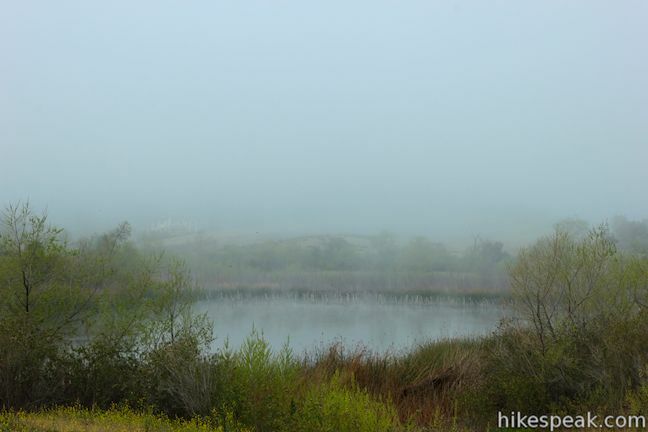 Lake View Loop is listed as 2.5 miles long by the park, but seemed to measure a bit longer. 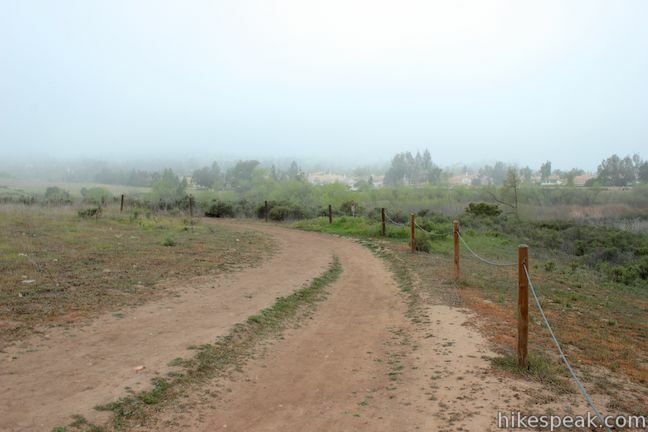 The majority of the trails in Peters Canyon Regional Park are wide dirt road. All junctions are well marked and dog and mountain bikes are welcome. 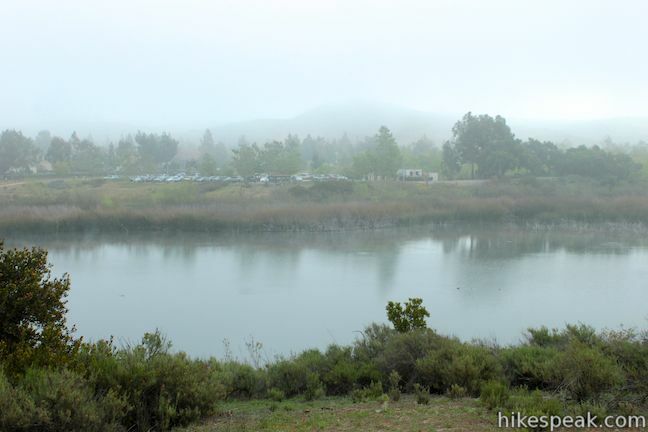 A $3 day use fee is required to park at the trailhead (as of January 2017), which can be paid by cash or credit card at an iron ranger. The park is open daily from 7 a.m. to sunset. 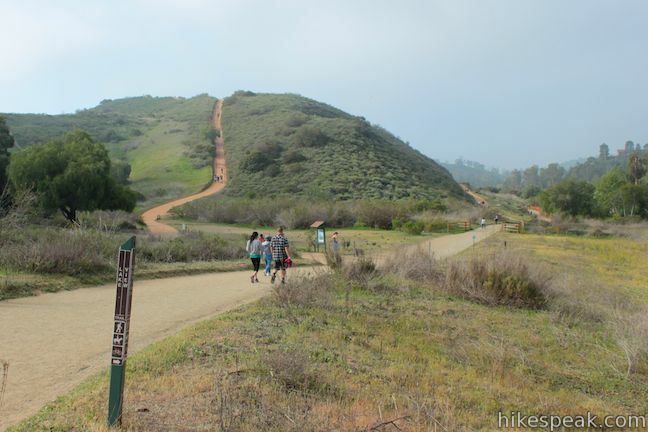 No permit is required to hike in Peters Canyon Regional Park, so get out and enjoy! 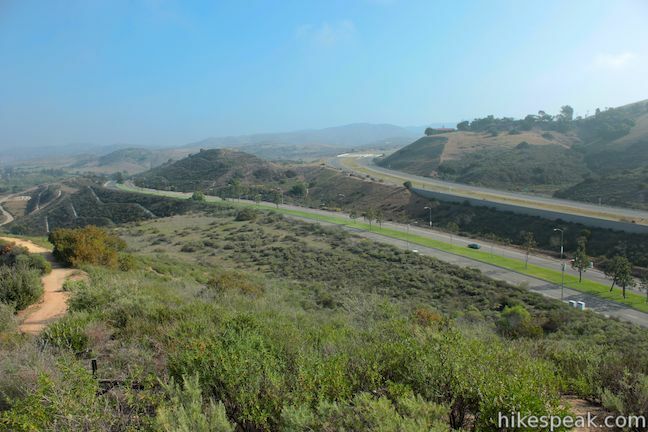 To get to the trailhead: Take the 5 Freeway to Irvine to exit 100 for Jamboree Road. 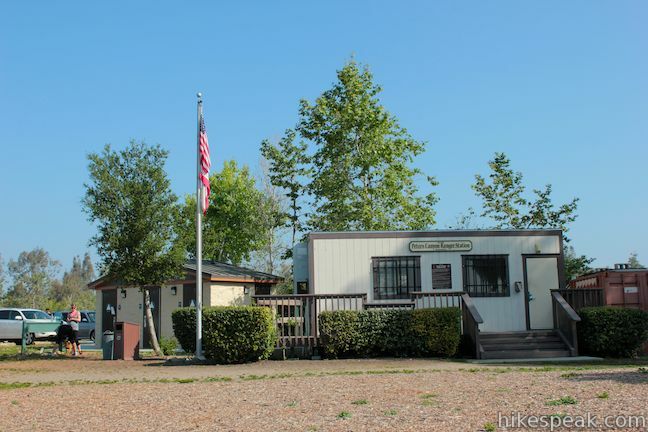 Drive north for 5.3 miles on Jamboree Road and turn left onto Canyon View Avenue. 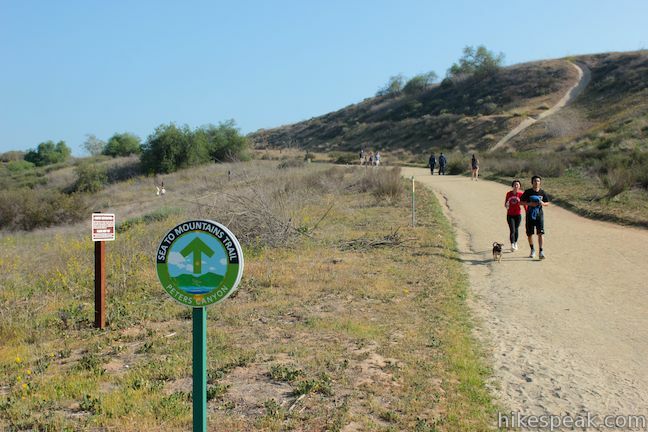 Proceed 0.2 miles and turn left into the main entrance for Peters Canyon Regional Park. 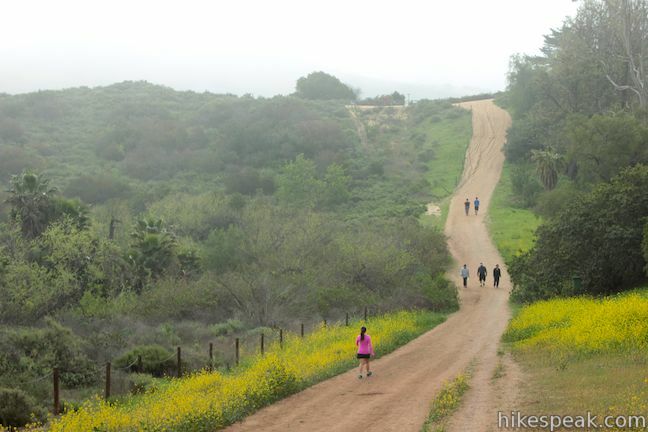 This 3.8-mile loop explores the side of a canyon in a wilderness connected to Santiago Oaks Regional Park near Anaheim. The lake was dry and was an eyesore. 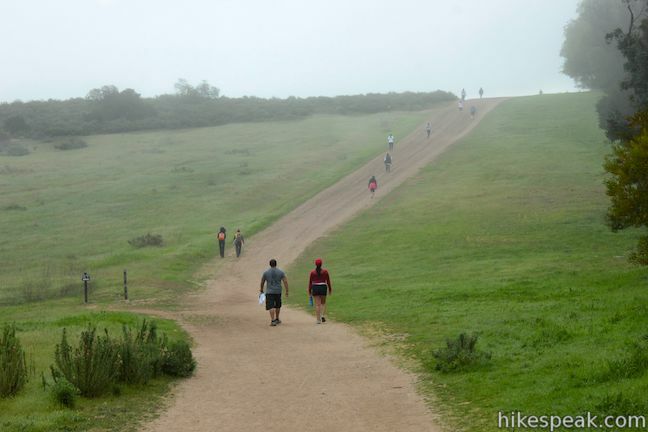 Otherwise, the hike is great again with the hills providing good work out!